Book, music and lyrics by Willy Russell. Directed by Bob Tomson and Bill Kenwright. De Montfort Hall, 27th October to 1st November. So, who is Willy Russell? A British dramatist, composer and lyricist who you might remember for Educating Rita, Shirley Valentine and Our Day Out. Born near Liverpool and educated at its University, we are told that Russell was ‘an only child of working-class parents with a troubled marriage.’ So, his musical Blood Brothers does seem to have a fair bit of biographical content. As a playwright, his first success was with John, Paul, George, Ringo… and Bert. Educating Rita came in 1980 and won him the Laurence Oliver award, coming out soon afterwards as a film starring Michael Cain and Julie Waters. So what is Blood Brothers about? Any good songs in it? None that I can remember. This is not a show I had seen before; and it didn’t leave me with any tunes that I could whilstle on the way home. But the score includes A Bright New Day, Marilyn Munroe and Tell Me It’s Not True, which are said to be ‘memorable.’ The cast at the dmh were fantastic, the singing was great, the orchestra was good and the dance routines were tolerable. The two leads roles, Mickey (Sean Jones) and Edward (Joel Benedict) were well casted and their performances and characterisations were convincing. Likewise, working class mum Mrs. Johnstone (Maureen Nolan) and posh lady Mrs. Lyons (Kate Jarman) were similarly well casted and their characters ably portrayed. The rest of the cast were somewhat cardboard cut-outs but that did not get in the way. Blood Brothers is a powerfully moving show, packed with compelling scenes and chortle inducing vignettes that take the audience on a roller coaster of farce, tragedy, comedy and catharsis. It’s stuff you can laugh at and cry with. The dmh audience gave the show its traditional standing ovation. It was a good production then? I did. Even if the word ‘enjoy’ is possibly less than apt. This haunting, emotionally charged epic tale of love, family, fate and loyalty left me feeling somewhat sell-shocked and a little drained but then I prefer something that pulls at the heart-strings, lifts the spirits only to send them crashing into a harrowing darkness – not unlike the kind of stuff we will experience when La Traviata comes to Leicester and it’s certainly true that Blood Brothers has won critical acclaim from the provincial press during its tour of the local theatres. Sean Jones‘s portrayal of Mickey was impressive, particularly when he plays the adult character as a drug-addicted, unemployed, ex-prisoner – a real show-stopper. Joel Benedict‘s portrayal of posh twin Edward was astute and compelling. 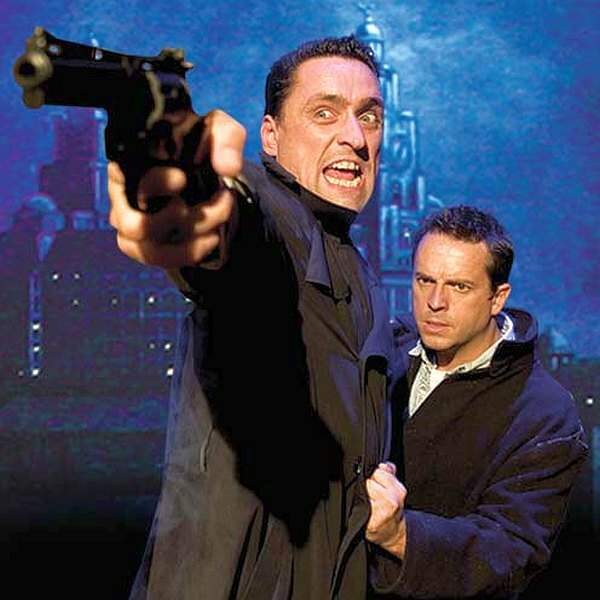 Pretty much Liverpool’s take on West Side Story, Blood Brothers is not a show you would easily forget. Find out more from the De Montfort Hall website.